Charts, you either love them or hate them. With lace or cables you can write out the directions if you prefer. Unfortunately, that's not an option for Fair Isle, and if you are not a fan…well…keep reading. Maybe some of the tips below will help change your mind. I happen to love charts. To me it is a quick way to see how a pattern is going to progress, whether in color work, lace or cables. The first thing that confuses many people about charts is where to start. Since English is the main language that we in the United States and Canada read, we want to start at the top left and work to the right and then skip down to the next line. Right? While that is correct for reading, it is wrong for following a chart. In fact you will want to do the exact opposite. 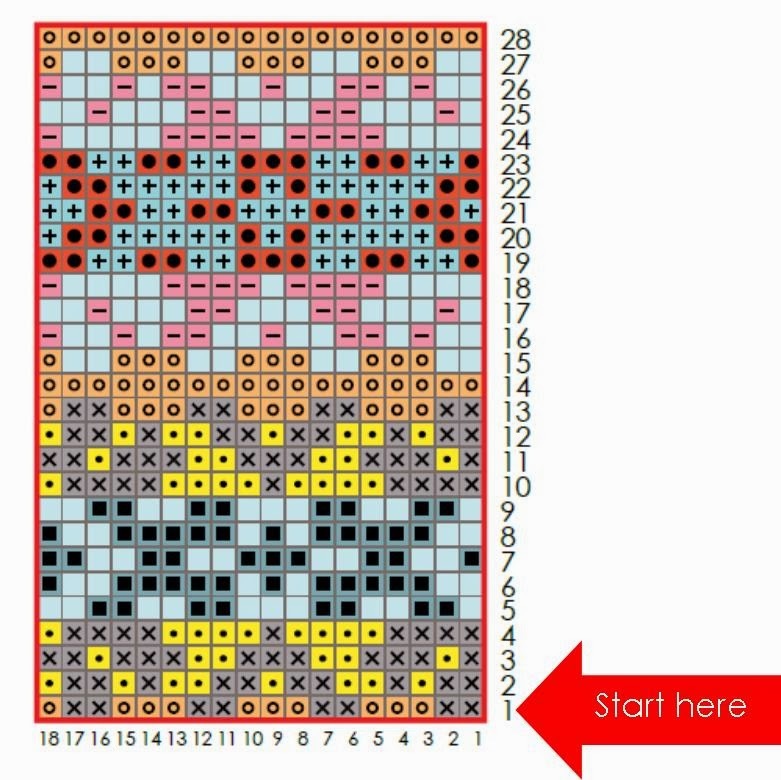 Row 1 is at the bottom of the chart and you want to start with the square that is on the far right side of the chart and end with the square on the far left. Think of it as reading your knitting/crochet. 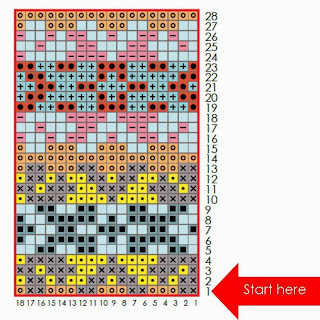 You will be following the chart in the direction you are knitting - from the bottom corner up to the top row, and from right to left. Ok...row one is done. Now what? Well that depends a little on how you are knitting. Are you knitting in the round or back and forth? 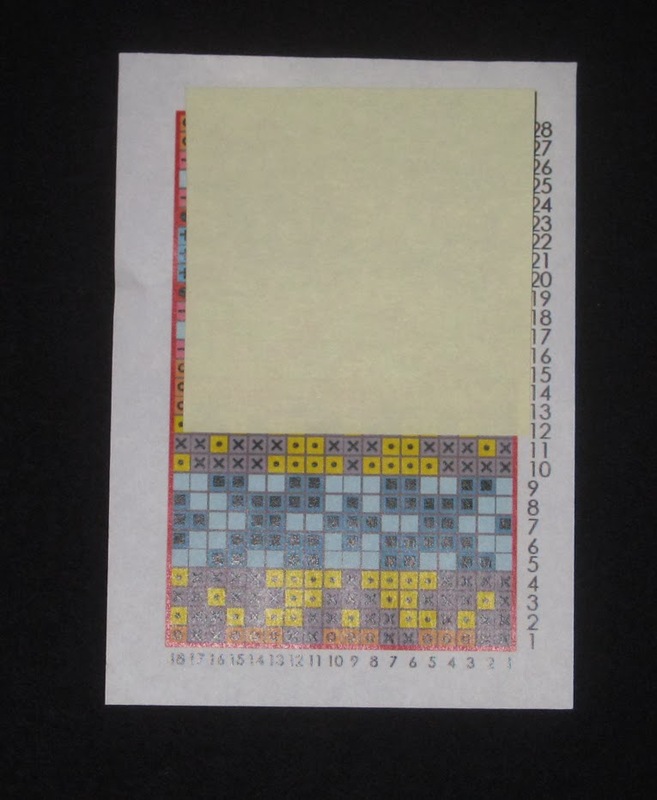 Keeping in mind that you are reading your chart the same way you are read your knitting/crochet, if you are working back and forth you will want to go up one row and start from the left hand side work to the far right hand side. Think of it as a zig zag. You work one row zig and the next row zag. 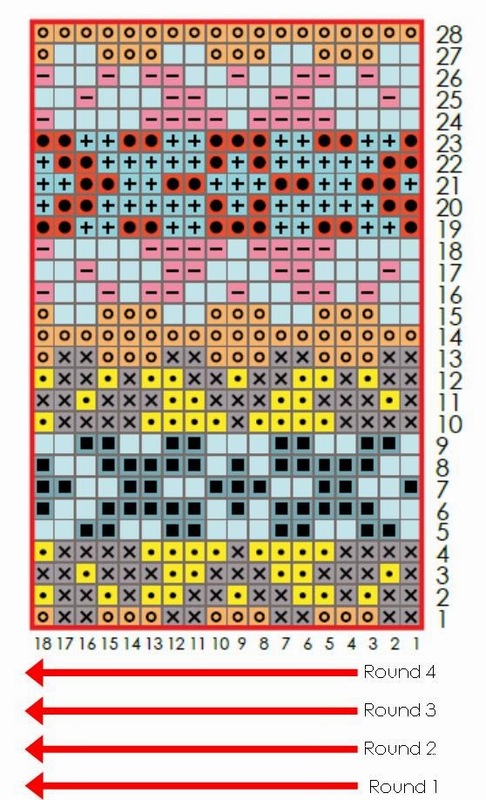 Many Fair Isle patterns are worked in the round (yay…no purling). Therefore you need to change the way you read your chart. 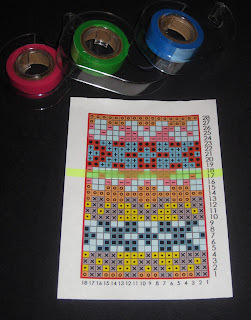 Because you are building on top of the round below (like a slinky) you will want to start row two of your chart on the right hand side and work right to left. 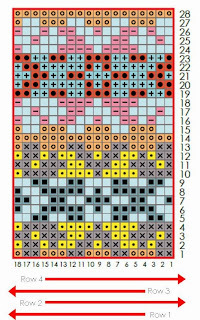 Many Fair Isle patterns are symmetrical and it wouldn’t matter too much it you read the chart from left to right, but some have an extra stitch that helps transition the pattern from one repeat into the next. And it’s always a good idea to learn the right way to do something, so you don’t have to re-learn it later. Ok, so now we know how to read a chart. But what if you tend to get lost in the chart? There are lots of good tools out there to help you, which vary from the inexpensive to the costly. And from simple to high-tech. 1. The first is a simple and cheap time honored method. Make a photo copy or print out a copy of the chart. 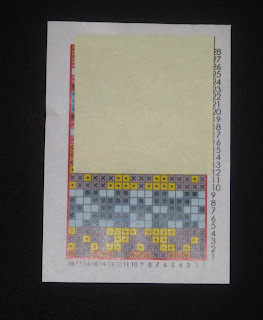 Use a post-it note to track what row you are on. Yep it’s that simple. A copy and a post-it note. But be sure to place the post-it just above the row you are working on. 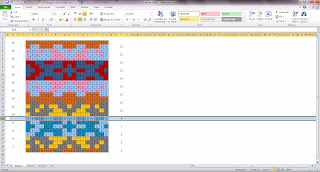 Since you are building on the previous row, you will want to see how the chart is progressing compared to your knitting. This will help you determine if you are on track and spot any mistakes early. In fact this tip is true of any of the methods I am mentioning. You can also use removable highlighter tape. Many yarn stores carry the highlighter tape in their notions section. If they don’t have it try your local office supply store. 2. The next is a little more Cathy Creative…but since I already know many of you are crafty, it might be worth a try. 3. 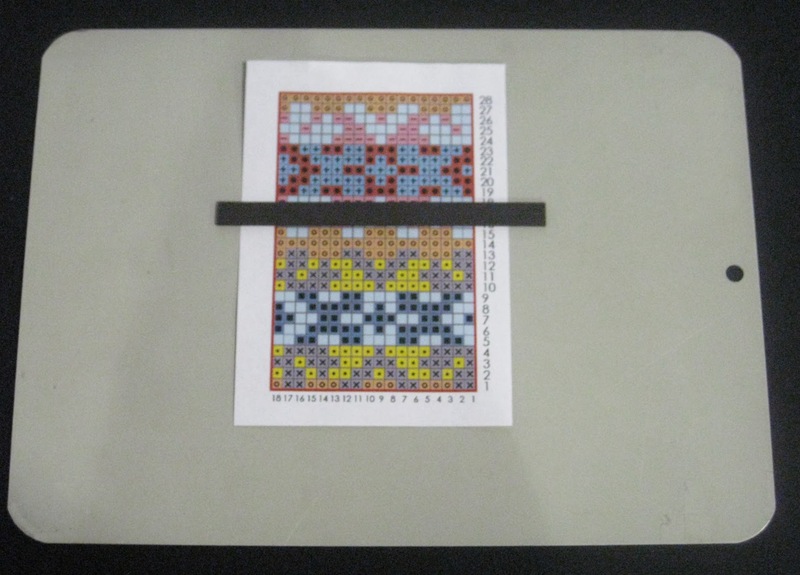 Many of you multi crafters already know that there are chart keepers out there for embroidery/ needlepoint/cross stitch. 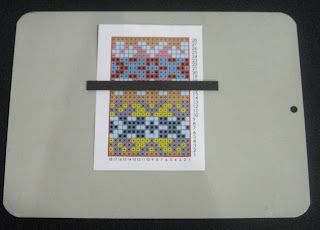 They usually consist of a thin metal board (with rounded edges, so you don’t hurt yourself) and a long straight magnet. They come in a variety of sizes and work really well. 4. The next method is starting to get a little more tech savvy, but uses something most of you already have…a computer and a spreadsheet application (like Excel). The tricky part is that you will want to ‘recreate’ you chart by changing you row width and using your conditional formattting tool (more on this in an upcoming post). This can be extremely helpful if you are changing the colors of your project from the original colors in the published pattern, as it will be easier to follow along. 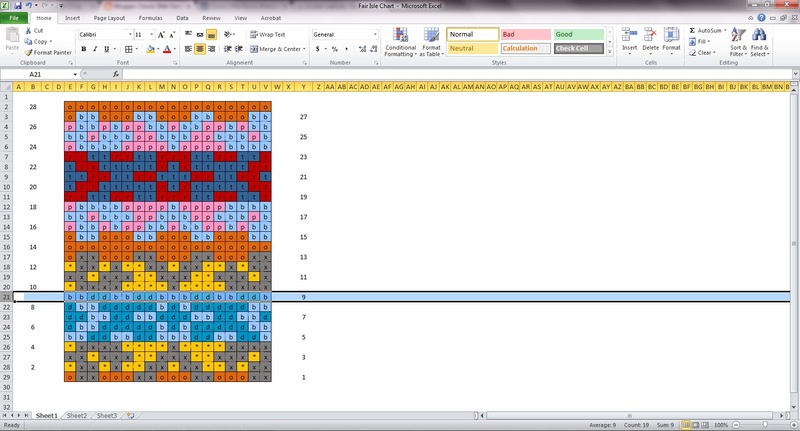 Once you have a chart in Excel, you can highlight the row above the one you are working and follow along that way. Of course, once you have created your chart you can save it as a pdf as well, great for uploading to a phone or tablet. Plus it's always good to have a back-up! 5. The last is the most costly, assuming you don’t already have the tools for this. But many of you will. Many of us carry with us with smart phones and/or some sort of tablet on a daily basis. Why not use one of the many apps that allow you to read a pdf for your knitting? Many of them also have options for making notes on the pattern, including making a large rectangle (or really any shape) or line that is movable. The one I use on my Kindle and iPhone also have an option to make the rectangle slightly transparent. Which I like because I can see what is coming up on the next row/round. These apps usually also have places you can make notes, either typed or hand written. 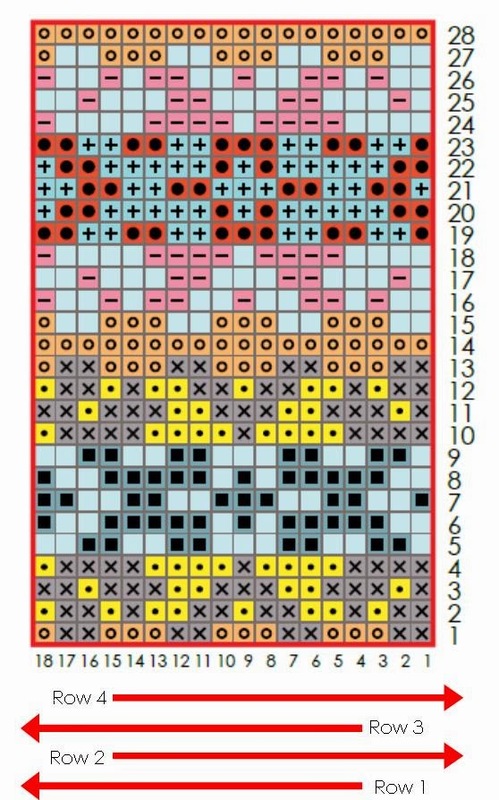 Which is a great tip for any knitting pattern – whether it has a chart or not. I know these sound simple, but believe me, getting lost in your chart is no fun. 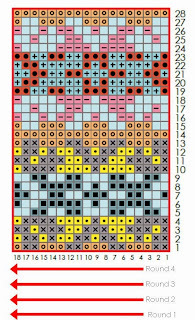 And these techniques are good if your chart is 10 stitches wide or 50! Do you have a technique that you use but I haven’t mentioned? I would love to hear it. And I am sure some of the other knitters would too! It’s here. It’s here! It’s here!!!! !